"Great Spanish rice as a main course meal. I usually serve it with mashed potatoes. Can be made less spicy using regular tomatoes." Melt butter in a skillet over medium heat. Cook and stir rice in the melted butter until rice is lightly browned, 3 to 4 minutes. Stir bell pepper and onion into rice and cook until bell pepper is softened and onion is translucent, 5 to 8 minutes. Break the ground beef into the rice mixture; cook and stir until beef is completely browned, 8 to 10 minutes. Stir tomato sauce and diced tomatoes into ground beef mixture. Cover, reduce heat, and simmer until rice is tender and liquid is absorbed, about 20 minutes. 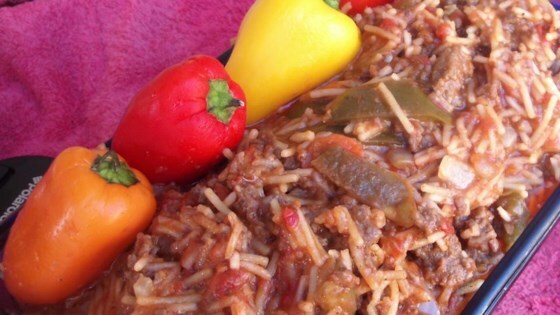 See a quick-and-easy recipe for the yummiest Spanish rice. Wish that I had seen Koolchick's warning Had never used Rotel tomatoes with green chilis before, and the result was very hot (spicey).. Next time I will use plain tomatoes. I used cooked rice, and it worked well. Have made this same recipe for years. You can use any kind of rice you like. We like Basmati.